When I landed in Portland, Oregon, for my interview with Kristin Ford of Woolfolk Yarn, I had an idyllic dream of the Pacific Northwest: gentle but steady rain, cloudy skies, and a mountain forest of conifer trees reaching out of the mist. While I packed for my quick visit, I glanced at my weather app and saw what I expected—little gray clouds with rain. When I emerged from the airport, I was decked out in my best rain gear: a black trench coat with a hood and rain boots. I didn’t know that I would really require hip waders, which my “chauffer,” Mr. Woolfolk, graciously offered to me. During the three days I was there, the Portland area received rainfall of historic proportions: about eight inches every day. From the Portland airport to Sauvie Island, a hamlet just outside of the city, we drove through a mudslide and a deeply flooded freeway, where diligent workers in hip waders were trying to clear the drainage pipes. We arrived soggy but whole at the world headquarters of Woolfolk Yarn, located in the Fords’ apple orchard, where Kristin was shipping orders of Far, Tynd, Sno, and Hygge. Despite my soggy state, she came over to hug me, welcoming me to her home and congratulating us on not drowning on the way. She quickly showed me around the farm-equipment garage that had been converted to the warehouse and shipment center of the Woolfolk operation. Huge boxes full of yarn with labels from Peru were stacked up on pallets to protect them from any rising waters. The shipment area (my favorite) con¬sists of Kristin, her laptop, a printer, and shelves of first-runs and open bags of yarn, which usually end up in the hands of designers and editors—most happily, in my hands! After our quick “shopping trip” in the warehouse, we hopped into her SUV and drove up the long driveway to her house, which is on the farm but is certainly not a “farmhouse.” Modern, with sharp lines and innovative hardware, seamless doors, and big windows that look out over the Willamette River, the house this architect-turned-yarn-guru designed is a cozy minimalist retreat. After taking in the thoughtfully understated design, unobtrusive colors, and inviting atmosphere of the Ford home, I knew I had seen the roots of the Woolfolk aesthetic. Kristin developed Woolfolk Yarn after Bill Parker, the U.S. representative for Ovis 21, presented her with the opportunity to buy the Ultimate Merino fleece brand, which has become the bedrock of Woolfolk. (Ovis 21 was co-founded by Ricardo Fenton and Pablo Borelli more than a decade ago in Argentina as hub of the Savory Institute, a worldwide organization that promotes the restoration of the world’s grasslands through ethical practices and holistic management. Reaching from Argentina to Chile and Uruguay, Ovis 21 is one of the many Savory Institute hubs around the world.) 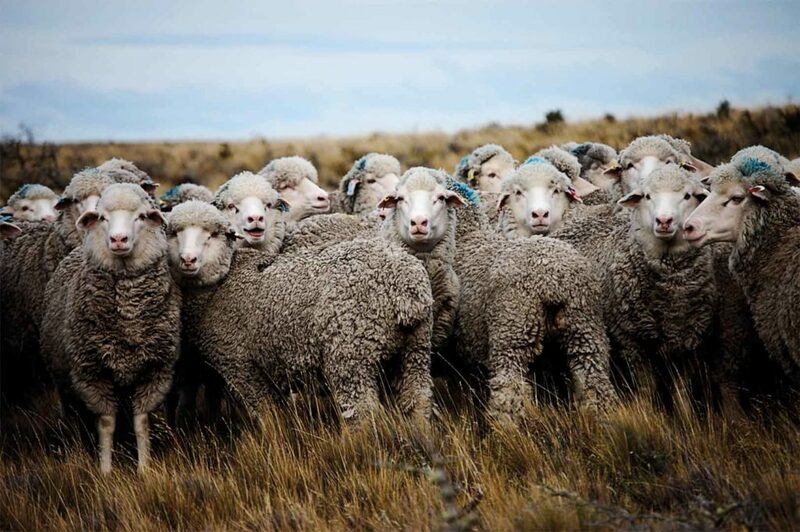 The Ovis 21–certified network of farms has produced some of the finest wool fiber in the world while sustaining the ecological and economic devel¬opment of farming and grassland regeneration in South America . In partnering with Ovis 21, Woolfolk has become the exclusive source of the finest merino in handknitting, making the yarn line truly one of a kind. Woolfolk Yarn’s foundation, however, was laid long before Ovis 21 was created. It began at the elbow of Katherine Temple Woolfolk, Kristin’s grandmother, who taught her how to knit when she was five years old. 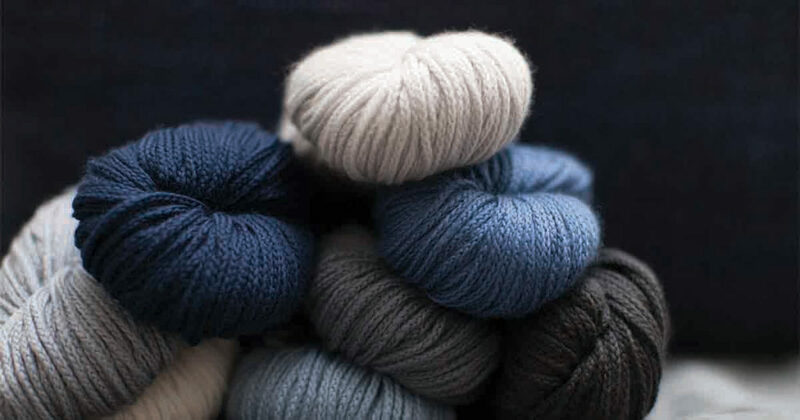 By blending her Scandinavian heritage with the strong influence of her architectural background, Kristin has produced several lines of highly sought after, sophisticated, and luxurious yarn at a reasonable price. Within the last year, Woolfolk has gone international, setting up retail locations in Europe, Japan, Australia, and Canada as well as in forty-four locations in the United States. By the time I went to Portland, I already felt like I was visiting an old friend, even though we had never met. I had the pleasure of staying at her home, and while I was there, learning about the origins of Woolfolk. I also learned about salmon fishing from her husband, Rich, and ate fresh-caught Pacific Northwest salmon several times. I’ve been invited back to go fishing when “monsoon” season has passed. I can’t think of a better way to spend a weekend: knitting on a boat with a line cast into the river, waiting for my dinner to bite. 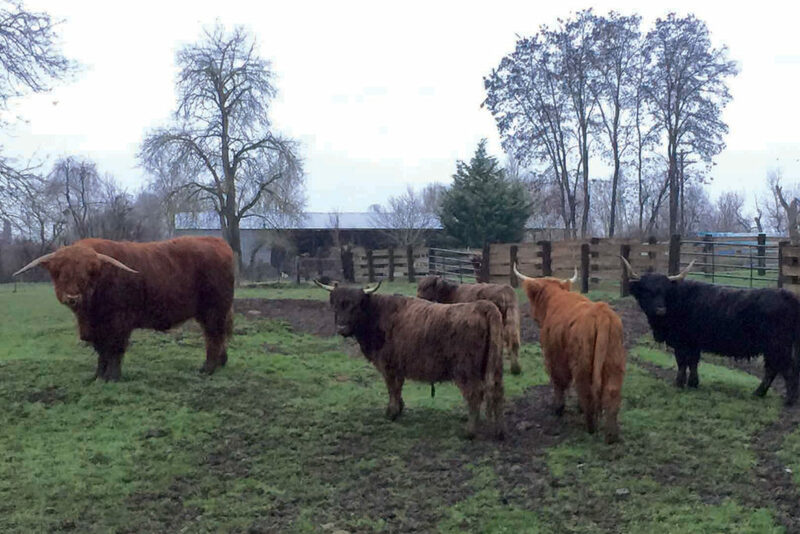 And if an apple orchard (which, until recently, was producing cider), Nigerian goats, four dogs, and weekends of salmon fishing weren’t enough—all that on top of producing Woolfolk Yarn—we took a short, rainy stroll down to where Kristin and Rich raise Highland cattle. Just before I finished this article, I received an email from Kristin inviting me to join her and Rich at the National Western Stock Show in Denver. As a recent transplant from New York to the Wild West of Colorado, I jumped at the opportunity. I put on my best cowgirl boots and met them in the Beef Palace Arena on the stock-show grounds just in time to watch Rich bid for their new Highland bull, Raisin Cain from Shat Acres Farm, Vermont. It was exhilarating! What I’ve taken from these enriching experiences is that Woolfolk Yarn is a mosaic of Kristin and her life. More than beautiful graphic design and sophisticated colors and fibers, Woolfolk is the vision of the ecologically minded conservationist; the hard-working, adventurous outdoorswoman; the modern architect; and the inheritor of her ancestors’ traditions. 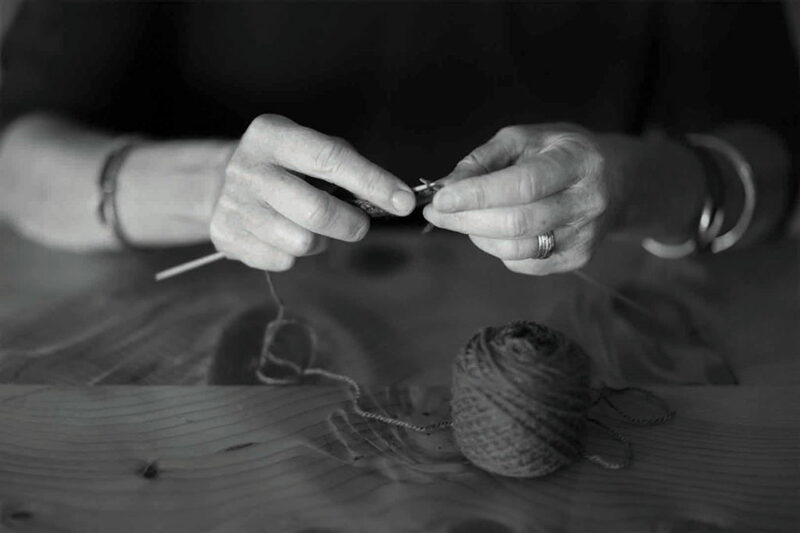 Together, the pieces create the finished work that is Woolfolk Yarn. Discover the beauty of Woolfolk Yarn at www.woolfolkyarns.com. Meghan Babin is the editor-in-chief of Interweave Knits, knit.wear, and Wool Studio.